For the longest time ever I hated playing board games. Like cringed and moaned whenever someone brought a game out during a party. I later learned that its not that I hate all board games, I just really do not care for party games. Like the ones that require me to draw fast, do charades, know trivia, or try to get boardwalk before anyone else. In fact, the only actual board games that I owned growing up that I actually liked, was The Game of Life and Boogle. 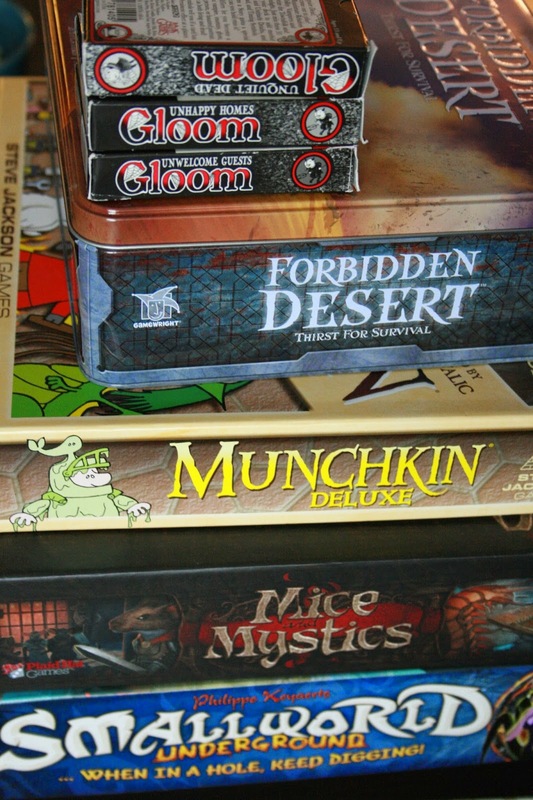 When I married my husband I knew that he loved playing board games. At the beginning, he would always beg me to try a new game with him and I would always decline. Just not my thing, I would say and he respected that. It just became the thing that Emily doesn't like - to play games. That is until we found a new game called Settlers of Catan. It looked interesting so I gave it a go, and from there on we just kept finding more and more games that I enjoyed playing. Settlers is the gateway game, they say. It was the game that made me realize that I don't hate all games, I just didn't discover the ones that I liked yet. Recently, to add to our ever growing game collection, we found these babies. And by found, I mean we bought them off a friend. I wanted to document them because they are pretty awesome and if you are at all like me and you have given up on finding a game that you like, I highly recommend that you play Settlers of Catan, followed by the games I am about to show you down below. Munckin expansions. I have played this game before and really enjoyed it so we were pretty thrilled when we found a few expansion packs. Even Bug got excited about all the pretty little figurines. This is a new to us game. Hubby and I played it over at a friends house, and even though on that particular day I was exhausted, I had a LOT of fun with this one. You get to be a mouse. Smallworld! Is a new friend of mine. I love this game. I love beating my husband in this game. From the creators of Pandemic, Forbidden Desert brings adventure! Not only do you have to compete against wind storms that bury parts that you need for your broken down ship, but you have to fight against the sun. Oh dehydration, how I hate being killed by you. Last but not least, Gloom - probably the most depressing story telling game you will ever play. But only because the whole point to the game is to make your family as miserable as possible and then kill them off. Sounds morbid - but its hilarious, and really fun if you have great story-telling friends.